Updated: 10/26/16 I recently interviewed a mom whose son has a peanut and tree nut allergy. I asked her how she would feel if someday every house had a teal pumpkin on Halloween. She broke down sobbing and said it would mean that kids like her son could finally feel accepted. It is estimated that 1 in 13 kids have food allergies. Those kids are often left out of the Halloween fun, since most candy is off limits. 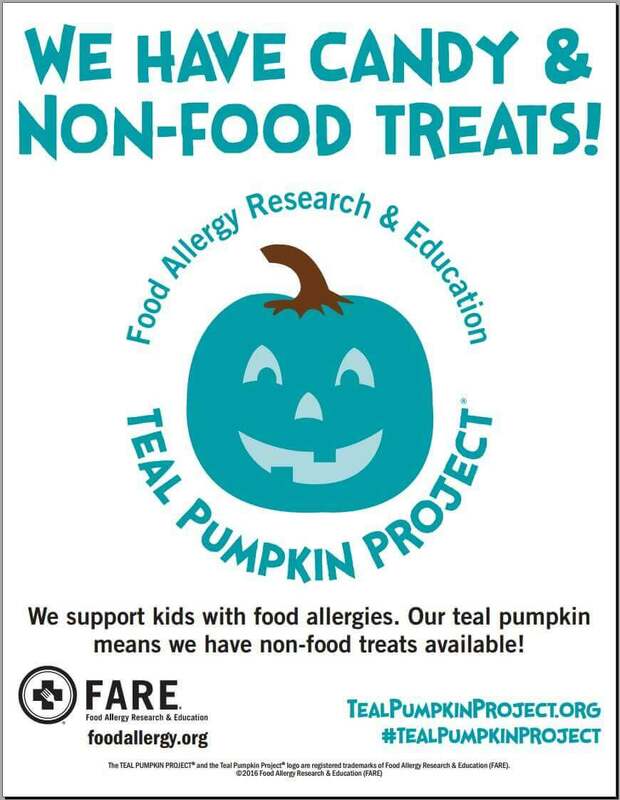 So, the Teal Pumpkin Project is encouraging families nationwide to offer non-food treats instead of, or in addition to, candy. The Teal Pumpkin Project is a worldwide movement to help every child experience the joy and tradition of trick-or-treating on Halloween. “Last year, households from all 50 states and 14 countries participated,” according to Food Allergy Research and Education (FARE). We’re lucky. Our toddler is allergy free. But over the past few months I’ve covered a series of food-allergy-related stories that have completely changed my world view. Imagine how difficult life would be if your child was always one bite away from a deadly allergic reaction. Best case scenario, you’re there with an overpriced EpiPen. Worst case, you’re not. And then there are the eye rolls, the whispers from annoyed parents who complain that your kid’s dietary restrictions are a burden on them. Tougher still, when those sentiments make your baby feel self conscious or ostracized. Well this year, I’m hoping to help change that—at least for one day. We’re encouraging every house in our neighborhood to participate in the Teal Pumpkin Project by handing out flyers and mini teal pumpkins. We also offered to supply signs and non-food treats for others to hand out on Halloween. For the record, we also have orange pumpkins and traditional candy in a separate bowl. Maybe you can’t convince your neighborhood to join in, but participating yourself is simple! 1) Provide a non-food treat option for trick-or-treaters. I grabbed a couple party favor value packs at a party store (includes things like tops, glow sticks, masks, tattoos, stickers, balls, etc.) They run about 2 cents a toy, cheaper than most candy. You can also check out the Dollar/99 Cent Store, Amazon or just order a kit from the Teal Pumpkin Project online. Too much work? Gather spare change around the house to hand out! 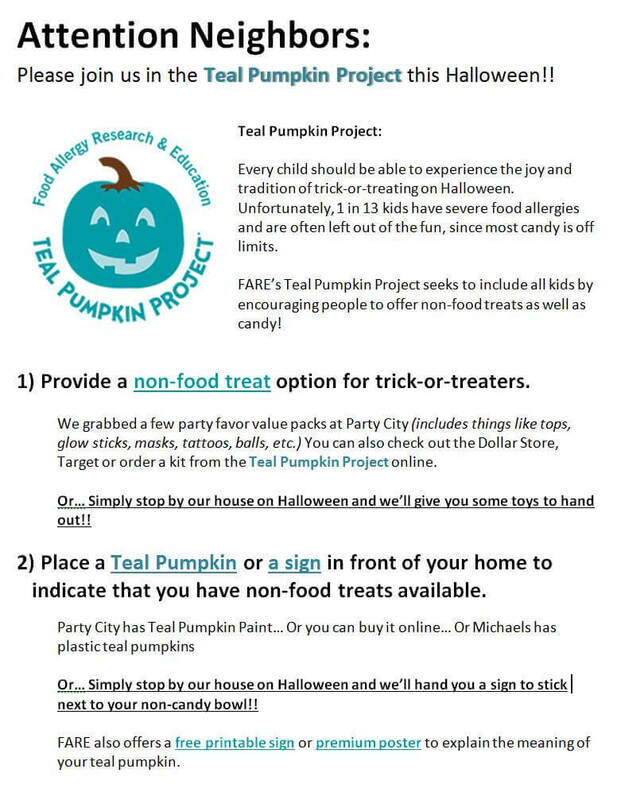 2) Place a teal pumpkin or a Teal Pumpkin Project sign in front of your home to indicate that you have non-food treats available. You can find official teal pumpkin paint at the party store or online. Though, a can of teal spray paint would work, too. Michael’s and CVS have plastic teal pumpkins in-store, and there are lots of teal pumpkins available on Amazon, Target online and ETSY. Too much work? Just print this PDF and stick it next to your non-candy bowl. FARE offers a verity of other free printable signs or premium posters to explain the meaning of your teal pumpkin. The Switch Witch is a great novelty item for young kids with allergies. On Halloween night, she magically switches your candy for a cool toy. Some moms also suggest the “invisible candy fairy” as an alternative. Snacksafely.com has a list of allergy-friendly candy. Like the Teal Pumpkin Project, they recommend you use a separate bowl for those types of treats. Teal Pumpkin Map: Register your home/neighborhood on their fever map so kids can find you. Next Door: Encourage your neighbors to participate, too, by posting a note or invite on Next Door. FARE’s interactive map shows a growing number teal pumpkin homes, but few neighborhoods with more than one house. Flyers & Free Treats: Consider handing out signs and bowls of non-food treats to neighbors on Halloween so kids have more than one Teal Pumpkin house on your block. Chime in below or on Facebook! NOTE: An earlier version of this story indicated that Tootsie Rolls were an allergy friendly treat. While they are nut-free, they do contain dairy and may cause an adverse reaction in children with soy allergies. Great post to start with, even better with the updates.